To date, I have received five designs in response to the parameters set on The Next Layout page. All designers are members of the Yahoo! Small Layout Design group. Sorry not to have got back to you sooner but I have been away in "outlaw" country and only just got back. #1 Add a bit to the left hand end but keep the angle, and add a strandard gauge track for your barrel car at the left. #2 do the same, but extend the NG siding left a bit, and add the SG track between it and the tree. #3 I know that you said you aren't keen on sector plates and hidden sidings, but including both, and dual gauging the left siding (and possibly along the front), similarly to Carl's "Les Peupliers" would be effective - of course that pre-supposes that you are happy to build dual gauge track!!! The hidden siding would be behind a back-board, and the dual-gauge siding could run into, or behind, a shed. #4 You would need to modify your Barrel Works slightly with a shed or similar at the right-hand side, to hide the continuous nature of the track. 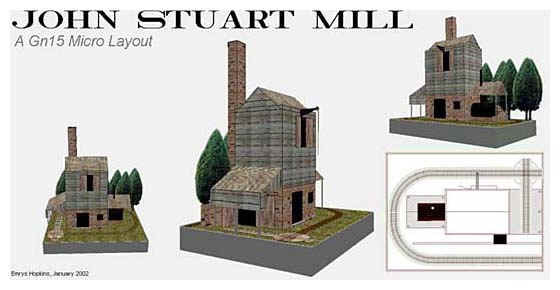 #5 Another alternative might be the John Stuart Mill layout that is on page 9 of Carl's first book, "52 MicroLayouts You Can Build". although, as it stands, it is not continuous and would need some modification. Basic idea is that the HO track is just for the Barrel car. The N-scale track (hope this is close to HOn30) is to deliver your wood and metal straps in order for the company to build the barrels. Has a loop so that the train can come in and then run around so that it can back the cars into the sidings but can be used for around the circle running. I just posted a sketch that includes everything but a place to move the standard gauge car out of sight. Both of these designs meet the four square foot constraint. I corresponded to Art about the standard gauge track and suggested that the barrel factory, and the standard gauge service track to it, be rotated 90 degrees counterclockwise. Then the standard gauge track could be extended to curve around parallel with the right edge of the layout and join the narrow gauge loop, forming a dual gauge track into the tunnel, where the barrel car could be hidden. Here's my proposal for your next layout. I admit I've borrowed some items from the previous contributors, but at one point I've made a strict change: The two gauges no longer meet at the factory corner. Here, the narrow gauge line has to serve the factory while the barrel car is gone, and vice versa. The concept is quite similar to that of Art Papaynanopulos (whose solution is indeed innovative), but I've left out the logging camp. However, lumber cars may be loaded inside the tunnel, if you make an opening at back (also convenient for "fiddling" and rerailing cars...). The Barrel Factory (and barrel car) is placed at the centre part of the layout, where it will get the main focus and can be fully admired by the audience and owner. Space for a sawmill has also good visibility, near the layout edge. I'd suggest modeling a heavy forest scene at the right-hand hill, to disguise the fact that it has no other scenic features. Leaving the hill rather unconspicuous will also help draw away the viewers' attention while you're hiding the barrel car in the tunnel. Tracks are quite crammed, in an attempt to disguise the rather sharp curves and the track oval (which also serves as a runaround track!). The "diamond" should also be a scenic attention-getter. It's possible to build a track (dotted line) between the top of the oval and the extension to Monte Sano RR, or you can simply put a scenic item here. In addition, I guess there's space for another track or two near the sawmill. When the barrel car is loaded at the factory track, cars from the sawmill will have to be spotted at the track lowest on the layout plan. For realistic unloading of cars at the factory (and loading/unloading at the sawmill), I'd suggest a functioning crane near the end of the factory, to perform this hard labor (hence the factory track is stretched beyond the building). The sawmill will need another crane, or another solution. If you handle loads this way, you'll have to return them to their starting points between operations. Suggestions: The loading track in front of the Barrel Company should be dual gauged as this is where the barrels are shipped from and the lumber received from. I would include the sawmill that Sam Swanson is building in Model Railroading as the source for your lumber. It is a water powered sawmill and the logs are received by truck, or flat car dumped down and embankment and stored in the dammed up creek. It is small enough that it would fit in the space requirements that you have and still be big enough to supply the barrel works. I too will have a stave and barrel mill on my new layout, I'm working on mini modules that will go onto a 30" x 60" module, but the space and the building will take up what you have proposed for your entire layout. It will share the same module as my main sawmill. The track plan as I see it is a simple C with the dual gauge running across the front to serve the barrel company. The narrow gauge would go around to the back where the sawmill is located. If you want more fun, you can add a kindling wood plant along side the barrel factory and run a siding into it. Take a look at narrowtracks.com then go to the Eastern loggers section of the site and take a look at their sawmill complex. It will give you some major ideas on how to place things.